Join Tim and Sally as they embark on an exciting and educational vacation to the seaside. Written in verse and perfect for early readers, Tim and Sally’s Beach Adventure reveals the joys and surprises in store for children on their first visit to the beach. The whole family, including the kids’ dog, Flip, eagerly look forward to the trip and arise before dawn to begin their journey. After watching the landscape change from rolling hills to coastal plain, the children rush to see the seashore and the ocean. During their stay at the beach, Tim, Sally, and Flip learn about aquatic creatures, ocean waves, tides, and sand-castle building while sharing in the fun of a family vacation. 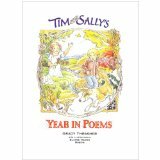 Written in verse and perfect for early readers, Tim and Sally’s Year in Poems highlights the order and rhythm of a year, focusing on a sense of place and the importance of tradition. Author Grady Thrasher showcases the details and events – from robins, bunnies, and daydreams to beginnings, endings, and holidays – that mark the passage of time and help give us our sense of who we are. This is a book that will help children and their parents remember their own good times – and perhaps make some new memories as they read together. Join Tim and Sally as they embark on a learning adventure about the joys of vegetable gardening. 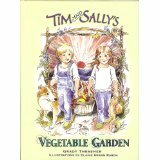 Written in verse and perfect for early readers, Tim and Sally’s Vegetable Garden teaches the mechanics of planning and sowing a garden, seen through the eyes of children experiencing it for the first time. With their dog, Flip, by their side, the whole family plans, plants, and tends their garden, eagerly awaiting the harvest and the thrill of eating food they had grown. This nostalgic, illustrated tale is reminiscent of an earlier time, where family works side-by-side and enjoys the simplicity and the wonder of discovery.